Design. Content. Mapping. Social Media. Webmasters. At Roofing Webmasters we strive to ensure our clients dominate their local markets. We do this through hard work providing every client with design, content, mapping, social media and more! We are full service webmasters providing superior SEO services for affordable rates. This month we’d like to highlight a client of ours in Weatherford / Fort Worth, Texas. Bronco Commercial Roofing is dominating their market for important keywords. This in turn creates new leads for them and more business. We began by redesigning their website and creating new optimized content for them. Then we set up all the other many components of a proper web presence such as mapping and social media. Now as their webmasters, we continue to update their site, add content, manage their blog, post to social media on their behalf and more! They show up on the first page of Google for countless important keywords. 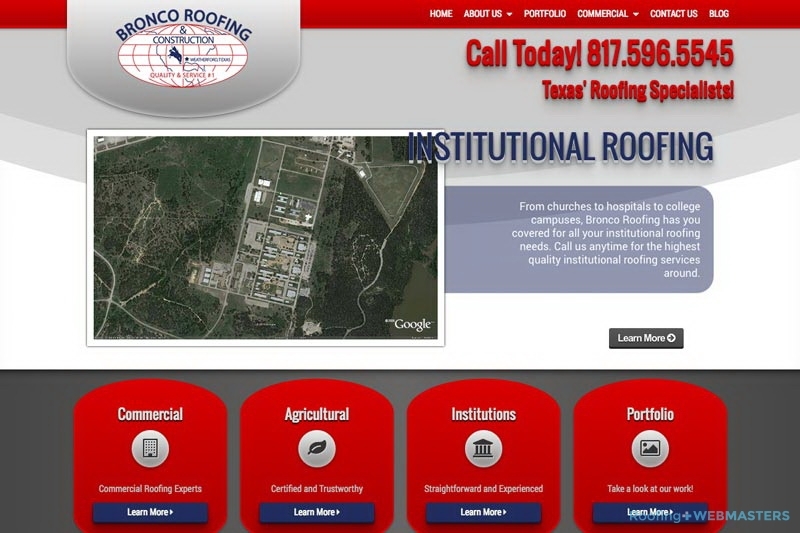 Check out the following keyword searches that have been performed recently that Bronco Commercial Roofing shows up on page one for! These are only some of the keywords they are dominating for. And we look forward to continuing to help them rise in the ranks. Ready to get started? You could be our next success story. Talk to us today about SEO for your roofing company!